2. Halve the pumpkin or squash and scoop the seeds out. Put the pumpkin halves, cut side up, into a roasting tray. Put a knob of butter and 1 tablespoon of soft brown sugar in the cavity of each half. Pour a little water into the base of the roasting tray, cover with foil, then put in the oven for around an hour, or until the pumpkin is completely tender. 3. Meanwhile, make the pastry. Put the flour, sugar and salt into a food processor and blitz briefly to combine. Add the butter and pulse until the mixture has the consistency of breadcrumbs. Add the egg yolks and pulse just until the pastry starts to clump together, adding a few tablespoons of cold water if you need to. Tip out onto a lightly floured board, knead a couple of times to make a smooth ball of dough, then wrap in clingfilm and chill in the fridge for half an hour. 4. Roll out the pastry and use to line a 3cm-deep, 30cm-diameter tart tin. Leave the excess pastry hanging over the edge. Put the tin on a baking sheet, line the pastry with greaseproof paper and baking beans, and bake for 20 minutes at 180°C/gas 4. Remove the paper and beans, prick the pastry in a few places with a fork, and bake for another 10 minutes. Leave to cool completely, then trim off the excess pastry using a small, sharp knife. Reduce the oven to 150°C/gas 2. 5. When the pumpkin is cooked, scoop out the soft flesh and buttery juices. Add the spices and a pinch of salt and mash thoroughly together, or puree in a food processor. 6. Peel, core and slice the apples. Put them in a pan with just a splash of water to stop them burning then put over a low heat and cook, stirring often, for about 20 minutes, until they have reduced to a puree. Let this cool, then stir into the pumpkin mixture. 7. Whisk the egg yolks, cream and remaining soft brown sugar together in a separate bowl, then fold them into the pumpkin mix. 8. Pile the apple and pumpkin mix into the baked pastry crust and smooth out with a knife. 9. Whisk the egg whites until they form stiff peaks, then whisk in the caster sugar a little at a time. 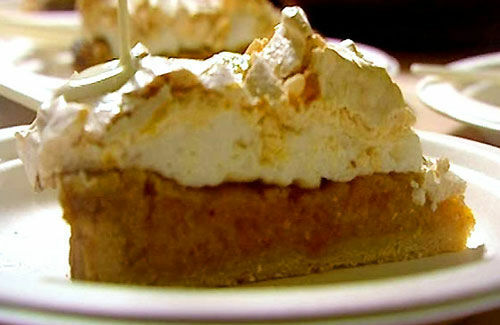 Keep going until you have smooth, thick, glossy meringue. You should be able to turn the bowl upside down without the meringue slipping out. Spread the meringue mixture on top of the pumpkin, swirling it up into peaks and making sure it completely covers the pastry edges. Bake at 150°C/gas 2 for about 45 minutes, or until the meringue is turning golden on top. Serve warm or cold, with cream.